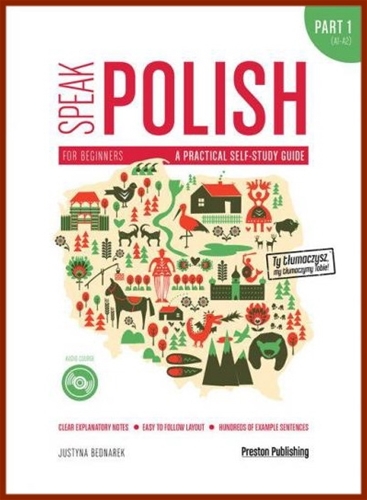 "Speak Polish. A Practical Self-study Guide is a new manual for students of Polish as a foreign language. Containing lists of sentences sorted according to grammar points, the course starts with the most basic concepts and takes the student on a journey towards more advanced grammar. The first part of the series is dedicated to students at levels A1-A2. Each chapter contains over 30 sentences which need to be translated and then compared to the correct answer provided on the right-hand side. This way, students have a chance to understand and practise a particular grammar point using everyday sentences. They can also correct their mistakes and review the vocabulary used in the sentences. The explanatory notes provided next to the sentences clearly present the theory and point out common mistakes made by learners. The book comes with a CD(mp3) with the complete audio course in two versions: English-Polish to practise speaking and Polish only to practise pronunciation and listening comprehension".